Every video game needs power ups. And now, mine does too. I decided, that, to give it a more game like feel, to have powerups that are triggered during various circumstances. 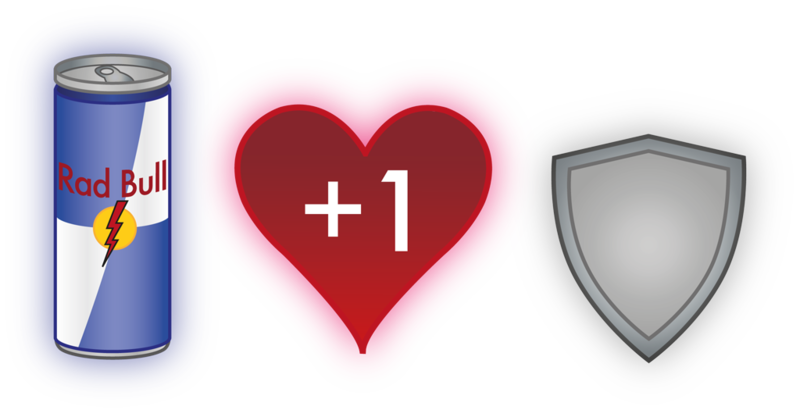 I have created three power ups, Rad Bull, Health and Shield. Rad Bull, not at all like Red Bull, the popular energy drink that I dont own the rights to, helps you concentrate harder. When you pick up the drink, suddenly everything is easier to kill as it lowers the level of concentration at which you need to kill things with. This powerup lasts for 5 seconds. It also only gets triggered to be released when your concentration levels remain at a low state for 4 seconds. Health gives you an extra life! How obscure! This gets triggered for release when your health is under 4 hearts. Shield protects you from monsters for 5 seconds. This gets triggered when your relaxation values remain high for 4 seconds or more. So, these powerups are fairly useful, and also a little intelligent about when they get released to give all players a fair playing ground when playing the game. Good players arn’t rewarded through powerups, crap ones are just helped along.